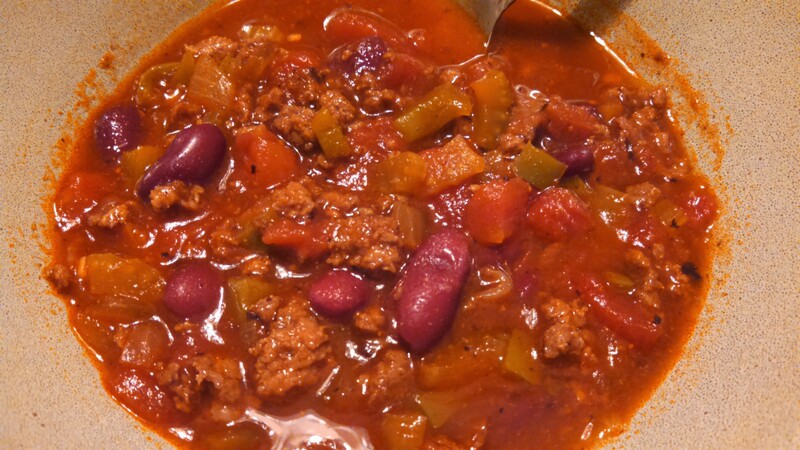 Lori at My Kinda Rain posted this recipe a little over a week ago, and when I saw it, I knew we had to try it. 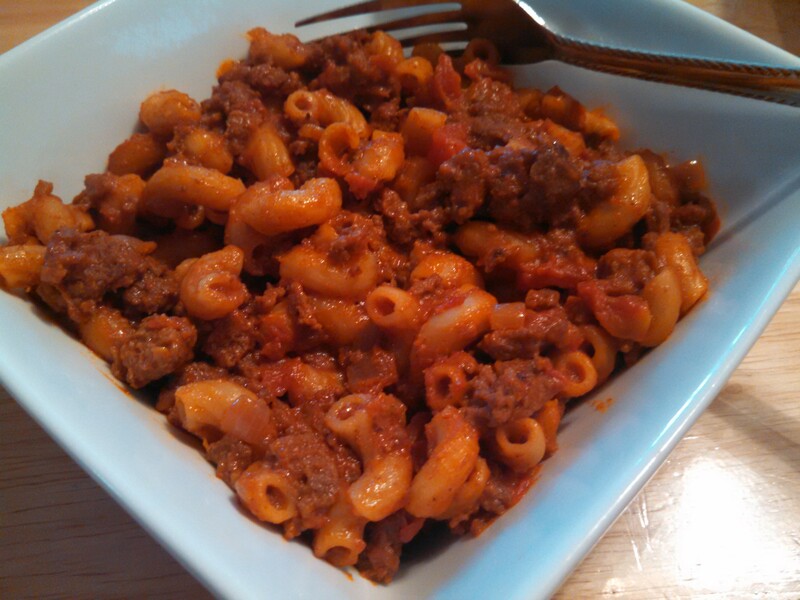 I love a lot of the meals she shares, quick and easy for families on the go. Since I stopped buying boxed meals a few years ago, I love when I can find something similar that I can make. I did make a few adjustments to Lori’s recipe. You can find her recipe here. We all LOVED it, and will be having it again soon! I recently acquired a zucchini and a yellow squash at a Kiwanis Club meeting. 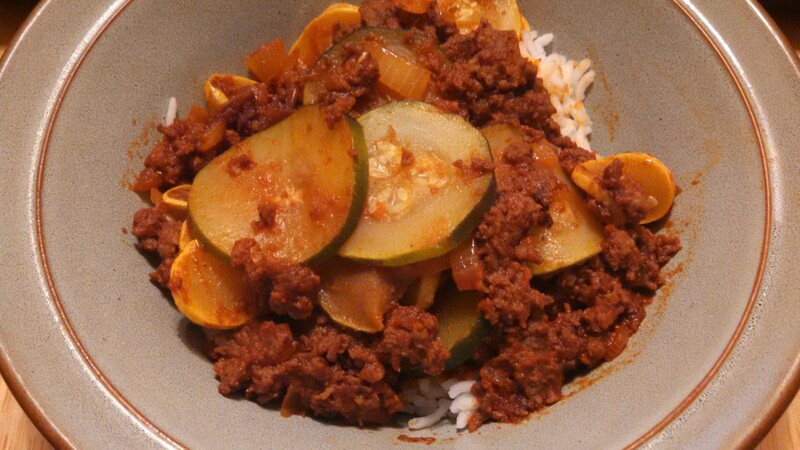 I have made plenty of different meals with zucchini and yellow squash, but wanted to try something new. So, I used what I had on hand, and came up with this combination. Even my little one liked it, and she’s been rather picky lately! It also took little time to put all together, which was nice with the busy nights we tend to have lately. 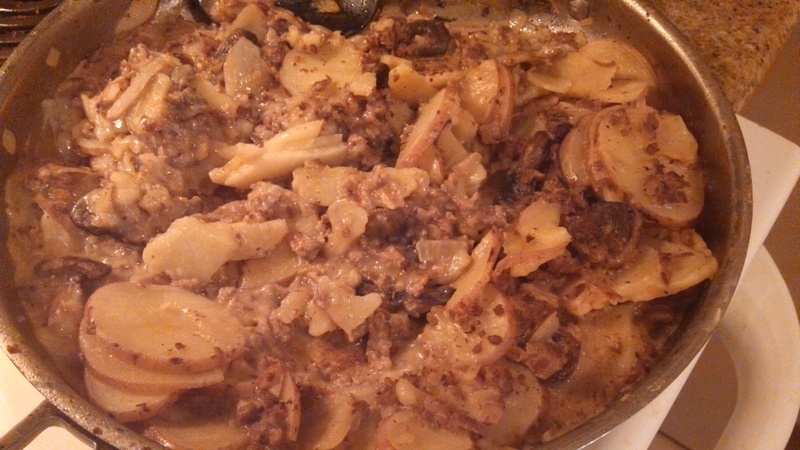 In a large skillet, brown ground beef over medium heat. Add in onions and garlic, and cook until onions are translucent. Next, stir in Worcestershire sauce, seasoned salt, tomato paste and beef broth. Add sliced zucchini and yellow squash. Cover, and reduce heat to medium-low. Cook for 10-15 minutes, or until squash has softened. 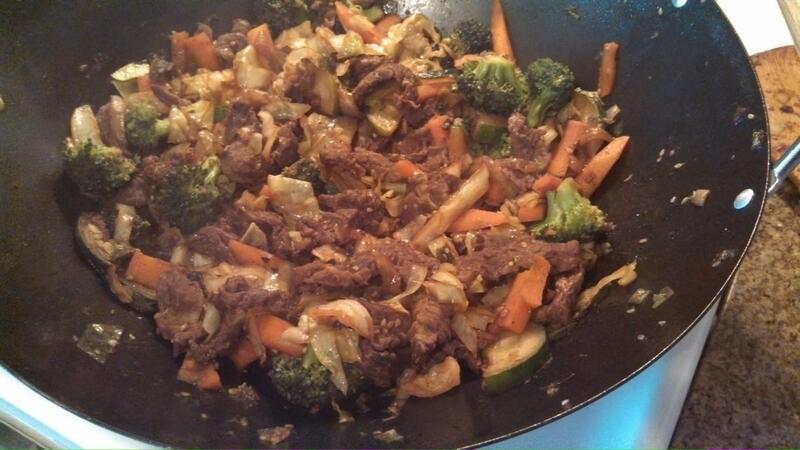 Stir in cooked rice and serve. This dish was inspired by the other part of Jamie Oliver’s 15 Minute Meals. 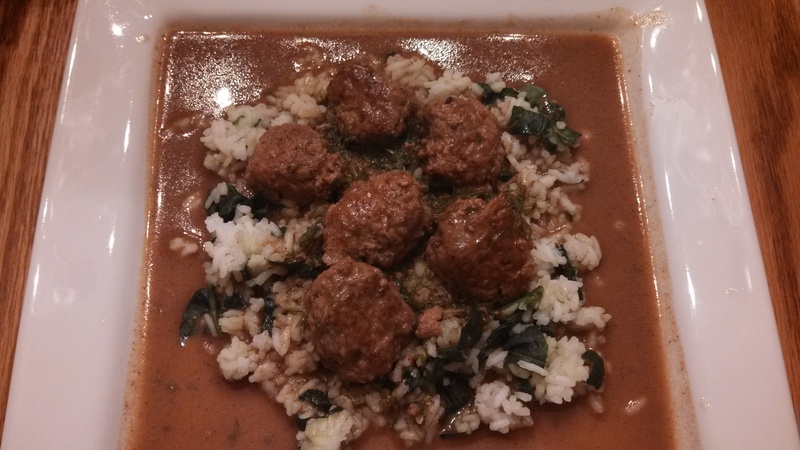 His dish was Swedish Meatballs with Celeriac and Spinach Rice. I liked that he used dill, since I had some fresh dill on hand. I looked at some other recipes online, and created a blend of a few different meatball recipes. This was really, really good. Everyone liked it, and there really wasn’t much leftover. Below, I have the recipe for the meatballs and sauce. I served it over rice with spinach, but mashed potatoes or egg noodles would work well with this too. For the rice, I cooked the rice in my steamer, then put in a large bowl when it was done. I quickly added chopped spinach to it while still very hot, mixing well. That way, I got a vegetable in! In a large bowl, soak breadcrumbs in the milk for a few minutes. Mix in onion, 2 tablespoons dill, ground beef, eggs, and salt and pepper. Heat olive oil in a large skillet over medium high heat. Roll ground beef into 1″ balls. Add to the heated skillet and brown each meatball on every side, in batches if necessary. When browned, remove to a plate. Reduce the heat to medium low and melt butter in the skillet. Mix in flour. Cook, stirring often, until you have a brown roux. Whisk in beef stock, then cream and 1/4 cup fresh dill. Add meatballs into the sauce. Cover and turn heat down to low. Cook for 10-15 minutes, or until meatballs have cooked through to an internal temperature of 160 F.
I came up with this on a night that my older daughter wanted Spinach Bacon Shells and Cheese. I didn’t have any bacon thawed, but I did have ground beef thawed, so I made the shells and the cheese sauce like in that recipe, and then seasoned ground beef like I did for the Bacon Cheeseburger Soup I made recently. She and I were both happy with the results! 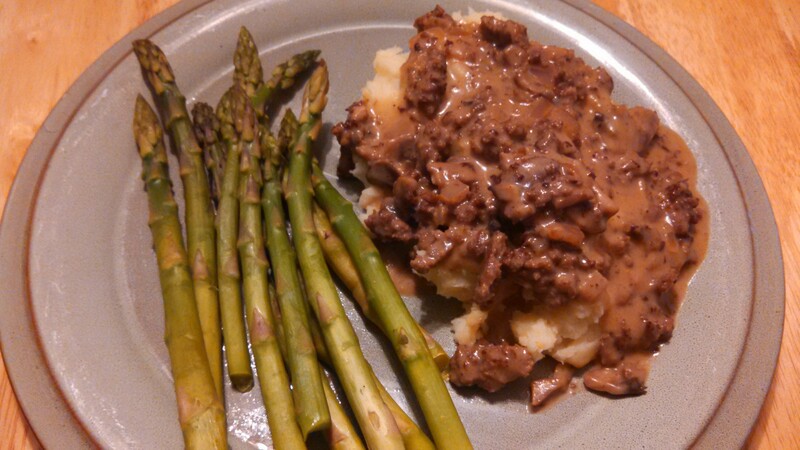 In a large skillet, mix together ground beef, Worcestershire sauce, seasoned salt, and pepper. Brown meat over medium high heat. Stir in diced onion, and cook until soft. 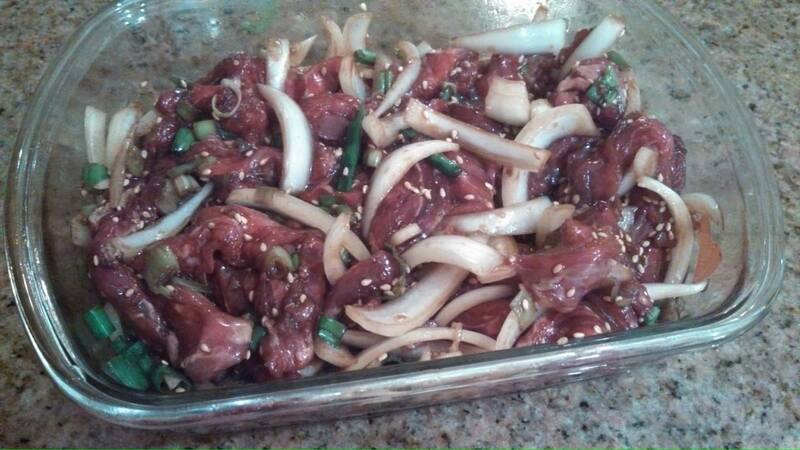 Pour in beef broth and reduce heat to low to simmer while you work on the other parts. Cook shells as directed on package, adding spinach in to cook for the last minute. Drain. Return to pot. In another large skillet, melt 1-2 Tbsp butter or margarine. Add flour; cook and stir until bubbly. Gradually stir in milk. Bring to boil, stirring constantly; cook 3 to 5 minutes, or until thickened. Stir in 1 1/2 cups shredded cheddar cheese and the Parmesan cheese; cook and stir until melted. 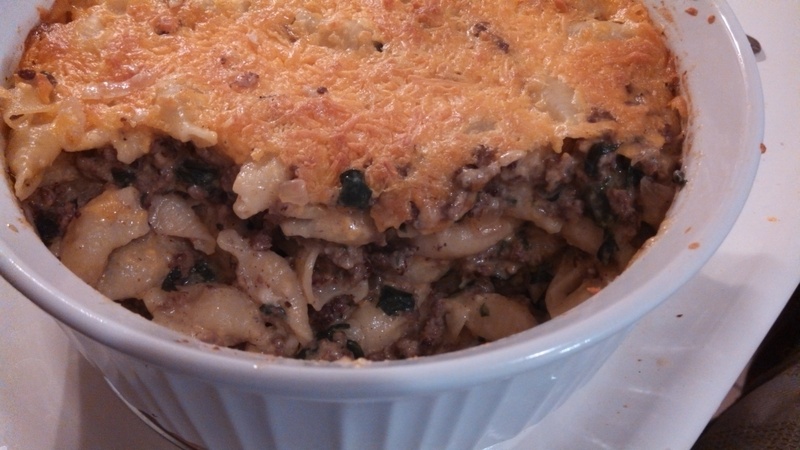 Pour ground beef mixture and cheese mixture over shells and spinach in the large pot; mix well. Pour into a greased 2-1/2 qt casserole. Top with the remaining shredded cheddar cheese. Bake in the preheated oven for 20 minutes, or until it is bubbling and the cheese on top is melted. 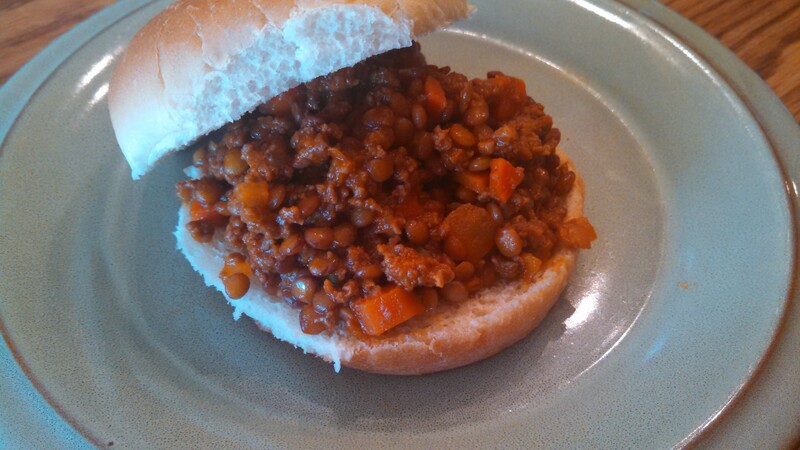 I’m at a loss at what to call this one, but I can promise you that it tastes good! I just picked up 20 pounds of breakfast sausage yesterday, so I wanted to use some of it to make dinner. 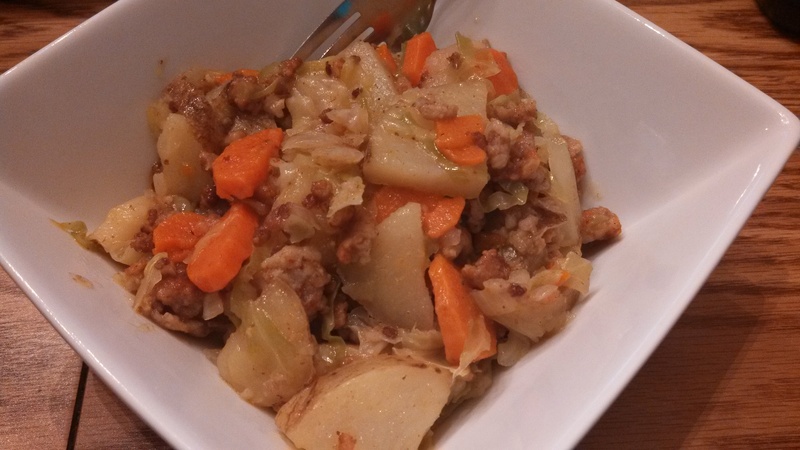 I also had onions, carrots, potatoes, and shredded cabbage, so why not put it all in a pot and see how it comes out? Delicious! The breakfast sausage is a little spicy, and I don’t really like eating as links, but with the casings removed, all of it broken up and browned, then mixed with other things, it’s perfect. What I also love is that aside from chopping things, this meal was very quick to prepare. In a large pot, brown sausage over medium heat. Add in onions and carrots, and continue to cook until onions are soft. Next, add water and potatoes. Reduce heat to low, and cover. Cook for 15 minutes. Finally, add cabbage and stir in well. Again, cover, and cook for 20-25 minutes, or until all vegetables are tender.